The University of Memphis saw their 12-game home winning streak snapped at the Liberty Bowl, while head coach Mike Norvell saw another haunting loss for the Tigers at the hands of UCF. Memphis put up 30 points on six drives in the first half and not a point more as the FBS series later widened to 12-0 in favor of the Knights. It was certain doom for UCF and their top-ten ranking, Milton’s Heisman campaign, the 18-0 win streak, and their college football playoff hopes. Problems arose on both sides of the ball in the first half for the visiting team: numerous penalties, missed tackles, and bad plays made the top-ten team look bottom-tier. Memphis’ Darrell Henderson couldn’t be stopped. The Tigers identified and took advantage of every weakness they found in UCF – two scores in the first quarter, three scores in the second quarter and Mike Norvell must have stood seemingly satisfied with the comfortable lead his team built against the unbeaten Knights. Milton suffered three sacks and struggled to overcome what the Memphis defense, rated far below UCF’s, brought to his doorstep. A three-score deficit resulted in the Knights’ lowest scoring game since 2017 featuring Navy and SMU away from home. At the start of the second half, the UCF defense made crucial and immediate adjustments and stuffed Memphis in the run and pass game ever since. Henderson was met with a defender on most plays. A slow close of the scoring gap broke when McKenzie Milton ran in for a touchdown to take the lead 31-30 in the final quarter. 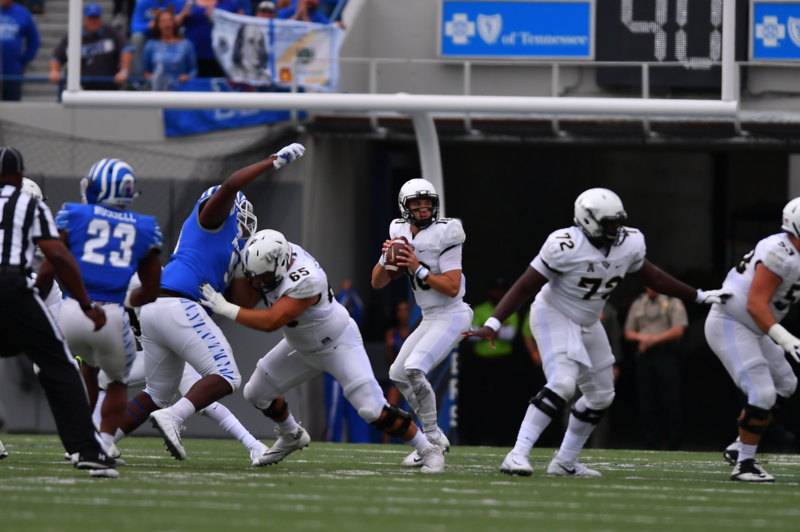 Three fumbles on alternating possessions within minutes changed the atmosphere in the fourth quarter as UCF recovered against Memphis, then fumbled on offense, then recovered again on defense. Knights fans would then see the slowest UCF tempo over the past two years as Heupel opted to play it safe and let the clock wind down. Runs through fourth down, and eating a delay of game penalty on the punt, were two of the ways the head coach made every second count. Memphis saw huge breaks with a first down at midfield and another right within field goal zone. A subsequent false start from their offense turned a possible 52-yard field goal to an improbable 57-yarder. Officials took 10 seconds from the clock after the penalty from the 28 yards left in the game to renew Norvell’s nightmare encounters with UCF. In 2017, Memphis’ only two losses – 40-13, 62-55 2OT – in an otherwise stellar season came at the hands of UCF. The latter being the American Conference Championship. One more pass within bounds from the Tigers saw the clock run out and the Knights and the UCF-faithful breathe and celebrate in relief.